The Bishop of Gloucester, the Rt Revd Rachel Treweek, will welcome six people into the Company of St Kyneburga in recognition of their long service to the life of the Church in and around Gloucestershire. She will present these awards during a special service at Gloucester Cathedral on Thursday 30 June at 5.30pm. The awards take place annually. The Company takes its name from Kyneburga, co-foundress and abbess in the eighth century of the first religious community at what is now Gloucester Cathedral. 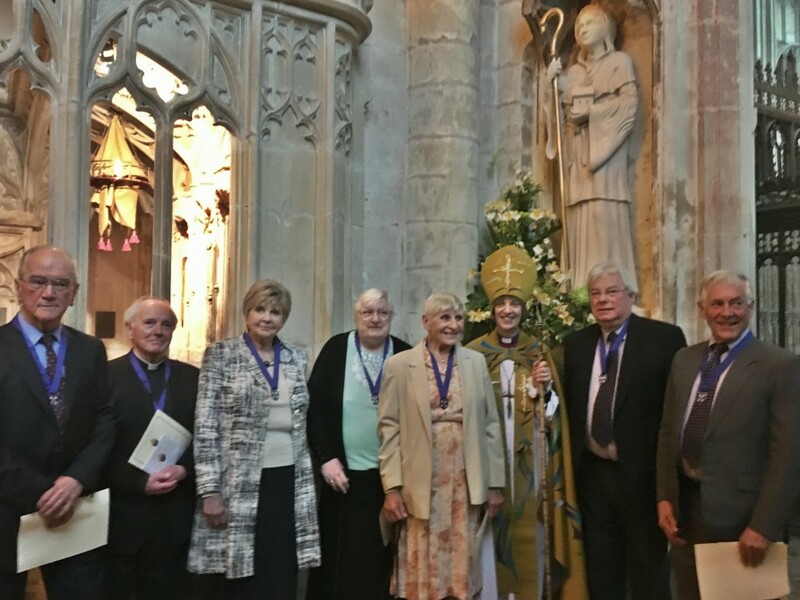 Membership of the Company of Saint Kyneburga recognises and honours service to the Diocese, usually over a very long period of time, by Readers, churchwardens, church architects, musicians, head teachers, clergy and others. Betty Cole is a current churchwarden of Maisemore, will shortly be 87 years old, and by this year’s Annual Parochial Church Meeting will have been the church secretary continuously for 60 years. When she became secretary (at 26 years old) she was working as a secretary in Gloucester. Her family have been members of Maisemore Church for a long time, and her grandparents, great aunts and great uncles, parents, and brother are all buried in the churchyard. She has supported the church for most of her life including helping to fundraise for the restoration of the church bells between 1959 and 1969 at a cost of £1,250. She saw the roof restored (between 1986 and 1987) for which £35,000 was raised. Home group small group leader, churchwarden, PCC member, Deanery Synod representative, church electrician, head of buildings maintenance for both St Andrews and St Bartholomew hurch buildings, overseer of restoration of St Bartholomew Cottage and various St Bartholomew church building projects, and Director of the reordering of St Andrews church building, for which he also supervised much of the work. Andrew has given stalwart service over many years, involving long hours of voluntary work, and is a member of the congregation respected by all ages. Peter Gould has been involved in the life of St Mary de Crypt Church, Gloucester for well over 50 years. In that time he has held many roles: treasurer, churchwarden, tower captain, cantor, sacristan, sidesperson and crucifer. He is a founder member of the Discover DeCrypt Project Group, the Heritage Lottery Fund project to regenerate the church and adjoining Tudor Old Crypt Schoolroom, and is currently Warden of St Mary de Crypt, working alongside the churchwardens of the United Parish of Hempsted with St Mary de Lode and St Mary de Crypt. His knowledge of the buildings is remarkable: he knows them literally from the top of the tower to the bottom of the crypt and seems to be able to fix most things! Peter has a deep faith which he lives out in practical service. He is endlessly generous with his time and DIY expertise, a wonderful ambassador not only for St Mary de Crypt but for the wider Church too. Judith Ivison has lived in the village of Down Ampney in Gloucestershire for 16 years, having moved from Chelsfield in Kent, following her retirement. She had a rewarding and distinguished career as a psychotherapist, working with many clergy, as well as doctors. She was involved in the formation and running of The West Kent Association of Pastoral Care and Counselling, as well as running groups and individual sessions for the British Doctors and Dentists Group at their annual conference. As a lifelong Anglican, she has been and remains fully involved in Church life, singing in the Cirencester Parish Church choir, serving on the PCC and the Deanery Synod, as well as doing voluntary Church Watch duty every two weeks. Colin Mattock is a retired priest living in Cirencester, having been a parish priest and Area Dean in the Diocese of Gloucester. He has a long commitment to the Diocese and gentle but committed service. Colin very quietly and very humbly does a lot of ministry for Cirencester Parish on the basis that, "I am just happy to pick-up whatever crumbs fall from the master's table."! A very saintly approach to ministry. Judith Mortimer was licensed as a Reader just over 25 years ago. She has served in Gloucester Deanery throughout her ministry, firstly in the parish of St Stephen, then St Mark, then St Mary de Lode and now in the united parish of Hempsted with St Mary de Lode and St Mary de Crypt. When Judith trained, she specialised in children’s ministry, which was apparently unusual at the time. Judith spent many years leading children’s ministry, running youth clubs, Sunday Schools and Junior Church. Judith was also very active with the Brownies and Girl Guides. The focus of Judith’s ministry in recent years has shifted to pastoral care of the elderly, particularly in the care homes in the parish. Judith offers this despite her own health challenges and her pastoral care and prayer is very much appreciated. It would be true to say that the Church is Judith’s family and that we continue to value greatly all that she offers. Peter Moss moved to Acton Turville over 35 years ago, and soon joined the PCC. He has served as fabric officer, treasurer, and church warden. He retired from the PCC five years ago, but continues to give his support to the church through his attendance at services, keeping an eye on the fabric, arranging effective repairs, tending the churchyard in the absence of a regular gardener, and supporting the services in his role as sidesperson. Peter gives his time to fund raising for the church; he and his wife have arranged many social events in their house and are supportive of other local fund raising. Their Lent lunches are especially valued by the community. Peter never ceases to serve the church community.